The Shutdown: A Guide To What Would And Wouldn't Close : It's All Politics How would government agencies and services be affected if lawmakers don't reach a budget deal by midnight? We've put together a quick breakdown. If Congress does not reach a budget agreement and the government shuts down, the U.S. 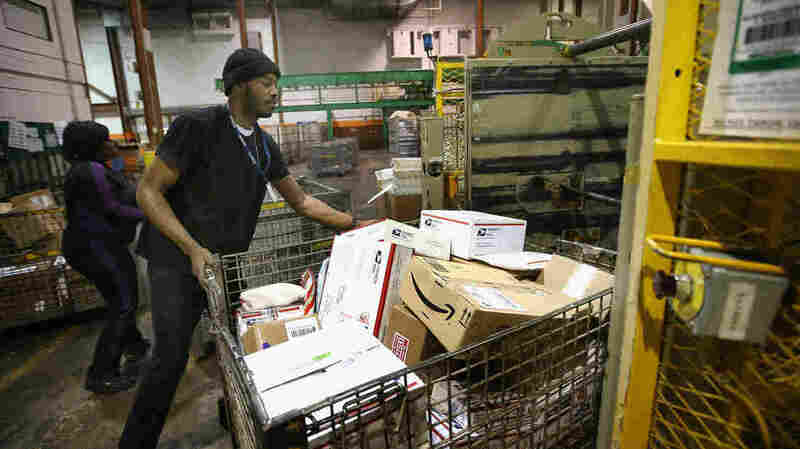 Postal Service is one agency expected to remain in operation. With House Republicans and Senate Democrats still miles apart on a budget deal, the federal government appears headed for a shutdown at 12:01 a.m. Tuesday. The Postal Service would continue to deliver mail on its regular schedule. The Federal Reserve, as a self-funded agency, would remain completely functional. Active-service military personnel would remain on the job. Food stamps would still be available through the Supplemental Nutrition Assistance Program. Unemployment benefits would still be distributed. Transportation Security Administration, air traffic control and border patrol officers would stay on duty. Entitlement programs: Social Security, Medicare and Medicaid checks would get sent out. Courts: The Supreme Court would be mostly unaffected, and federal courts could continue to operate for two weeks. Obamacare exchanges: The Affordable Care Act's state-run exchanges would open Tuesday as planned. The federal school lunch program is expected to stay intact through at least the end of October. Unlike in previous shutdown scenarios, the State Department would have the ability to continue issuing visas and passports due to a recent budget change. Some applications could still be delayed, however. National parks, museums and the National Zoo would be closed to the public. Environmental Protection Agency administrator Gina McCarthy warned last week that a government shutdown would mean "that EPA effectively shuts down." The Special Supplemental Nutrition Program for Women, Infants and Children (WIC) would run out of money. The Department of Housing and Urban Development would be unable to provide funds to local housing authorities. White House: Around three-fourths of White House staffers would face furloughs. The Internal Revenue Service would continue to collect taxes, but would be forced to suspend other services, such as audits and examinations of returns. The Department of Veterans Affairs would still offer medical services, but after a few weeks it would be unable to process benefits payments. The Food and Drug Administration would still execute recalls of food and drugs, but would be unable to maintain much of its usual oversight. The Energy Department would mostly shut down, aside from a few offices, including the one charged with oversight of the country's nuclear arsenal. The Securities and Exchange Commission would continue to post corporate filings to its website, but staff members wouldn't be able to review them. Most Department of Homeland Security operations would not be affected, but its e-Verify program, which allows businesses to check the legal immigration status of its employees, would shut down. The National Institutes of Health would still be able to conduct some research and provide services to current patients, but would not be able to accept any new patients. The Centers for Disease Control and Prevention would have "significantly reduced capacity" in responding to outbreaks and processing laboratory samples, but would "continue minimal support to protect the health and well-being of U.S. citizens." All Library of Congress buildings would close to the public and researchers. All public events would be cancelled and most websites would be inaccessible.